Due to today’s snow and forecasted freezing temperatures overnight, we will be having a two-hour delay for school tomorrow, Monday, February 4. Road conditions will be reassessed early Monday morning. If a closure is required, an additional announcement will be made by 6:00 a.m. 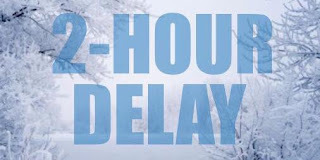 When schools open 2 hours late, the Shoreline Children’s Center and Extended Day sites will open 2 hours late, at 8:30 a.m. instead of 6:30 a.m. Preschool classrooms scheduled to begin at 8:15 will begin at 8:30. Classrooms beginning at 8:30 am, 9 am, 12:15 pm, or 1 pm will start at normal times.